A "Must Read" for every home cook! 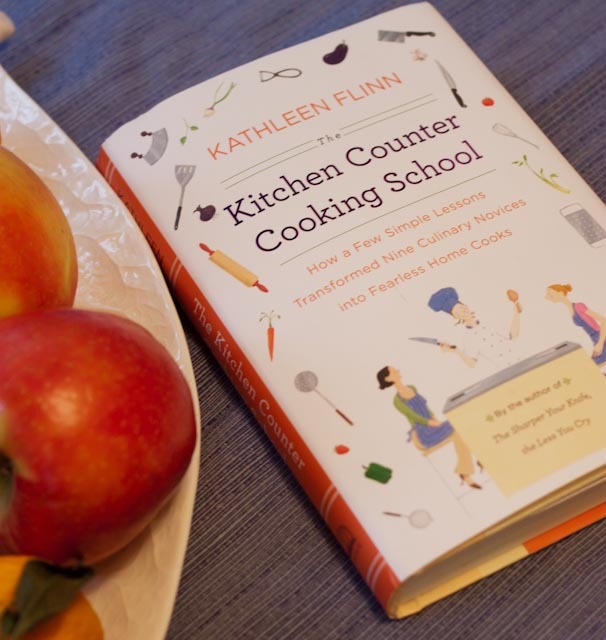 A blend of memoir, cookbook and reality show, Kathleen Flinn’s “The Kitchen Counter Cooking School” reminded me how satisfying it can be to cook with nutritious and flavorful ingredients using easy techniques. At first I didn’t see the connection between the two topics. What does dressing have to do with cooking? However as I thought about it, I realized they share many attributes. We must dress and eat day in and day out. Each requires a budget. And no one wants to waste money on buying the wrong thing. Who among us hasn’t found some garment in the back of a closet or some vegetable in the back of the refrigerator that we’ve forgotten? I can’t count the times that with good intentions I bought cauliflower or cabbage, only to let it rot in my refrigerator. Having the basics in your closet helps you put together a stylish look. And the same goes for the kitchen; a pantry and refrigerator stocked with basic ingredients is the first step to creating a flavorful and nutritious meal. Most of us don’t rely on recipes when it comes to clothes. Personal taste leads us to a particular color, certain accessories and a hip or classic style. We use an intuitive approach to matching colors and combining patterns. However In the kitchen, we seem to have less confidence in our ability. This is what I love about Flinn’s book. She shows us how to put a meal together without a recipe which encourages creativity and makes cooking fun. If you are looking for ways to reduce your consumption of processed food, eat more nutritiously, cook more creatively and cut your food budget, this book is for you. Maximize flavor with Flinn’s “flavor splashes,” a blend of a few ingredients from a particular cuisine. For example to make her “Asian Ginger Splash,” blend 2 teaspoons of sesame oil, I teaspoon fresh grated ginger or a couple of pinches of dried ginger, a few squeezes of lime juice and 1 teaspoon of soy sauce. Heat through for 3 minutes. Serve on steamed vegetables. Save money by making your own bread, soup, sauces and vinaigrette. Buy a whole chicken rather than a package of boneless skinless chicken breasts. One chicken can provide several meals. Use the bones to make chicken stock. Stop waste by planning meals. Use older foods first. Instead of throwing away that cauliflower that’s looking ‘tired’, add it to home-made soup. Use leftovers and you will save money and contribute to a better world. According to Flinn, people In the United States throw away about 40% of the food produced for consumption. When that food goes into landfills to rot, it emits methane gas, more toxic than carbon monoxide. Avoid processed food. Boxed food products, such as Hamburger Helper or Rice-a-Roni, are created “primarily to stimulate consumption.” Maximizing nutrition is an afterthought. Eating simpler foods that are more flavorful, with more fiber and nutrients, means we are satisfied with fewer calories and eat a healthier diet. I recommend this book to anyone looking for strategies for creating healthy, flavorful, home-cooked meals while saving time and money. This is a recipe I created using Kathleen Flinn’s “Fish en Papillote, or Baked in Paper.” Rather than offering exact recipes, Flinn’s approach invites creativity by offering general instructions. Hope you enjoy. On a 10 by 12 inch sheet of parchment paper, place sole fillet. Drizzle olive oil and lemon juice over fish, sprinkle with salt and pepper. 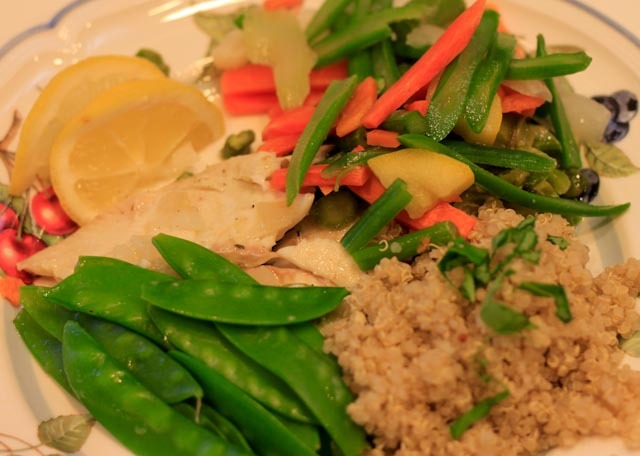 Place asparagus, carrots, onion and pea pods on top of fish. Season with salt, pepper and oregano. Fold parchment paper vertically and make 2 folds, and then twist ends. Put on baking sheet and place in oven for 20 minutes at 400 F.
Kathy, thank you for your insight of the book and the summary of the book. I love the concept of her book. I enjoy my leftovers at home, it’s healthier and faster than to call for a take out!